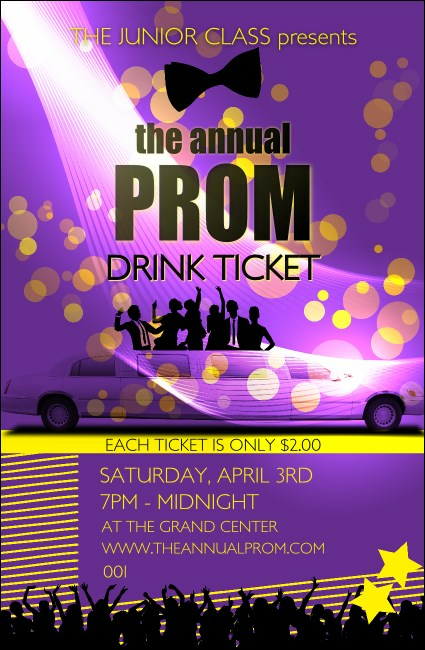 Let good taste be your guide when you use the Prom Limo Drink Ticket! This gorgeous template in bright purple and gold is filled with a partying crowd of fancy-dressed guests and a luxurious limo. Ten lines can be customized quickly to fill in your function's every detail. Approximately 2.71 inches x 4.14"
Minimize event planning chaos with the right drink ticket from TicketPrinting.com!